Partita a Quattro, A Game of Four, is a project curated by Ludovico Pratesi and it is dedicated to the evolution of sculpture within the younger generation. It brings together the works of Lupo Borgonovo (Milan 1985), Chiara Camoni (Piacenza 1974), Luca Francesconi (Mantova 1979) and Alessandro Roma (Milan 1977) who, through their exploration, propose differing approaches to this expressive language, which over the last decades has experienced and, continues to experience, a metamorphosis. The exhibition is presented as a reflection on the evolution of contemporary sculpture, along a course which brings to light the relationship between concept and material, structure and composition, process and authorship, tradition and innovation. The works present a multiplicity of views which are surprising and unexpected, and which the show proposes to analyze through the comparison of three emerging personalities. A revisiting of the methods of applying classic materials such as bronze, marble and ceramics, alongside images and found objects, constitute the expressive perspective of the invited artists, amongst the most interesting of the recent generation. 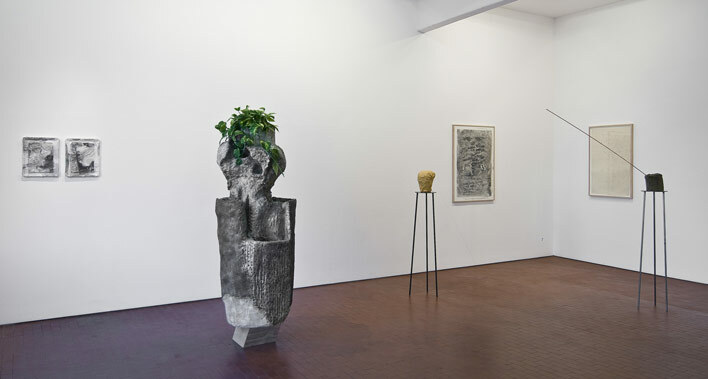 Each artist presents a series of works, from sculpture to bass relief and works on paper, which document the relationship between idealization and realization through its journey from the imagined dimension to the actual one, further evidenced by the varying spatial location within the gallery itself. The exhibition will be preceded by a debate, moderated by Ludovico Pratesi, with the participation of 10 artists who express themselves through sculpture, with the aim of sparking a confrontation on the diverse practices tied to such an expressive language. The debate will be on 7 December at 13:00 at the headquarters of CU.RA magazine in Via Ricciotti, 4 in Rome.